National Airways Corporation offers a full range of aviation services and products to the fixed wing and helicopter markets. We specialize in aircraft sales, aircraft maintenance, avionics, parts, charter, flight operations and pilot training. Aircraft Sales and Acquisition sometimes isn’t what it seems. This was the case with Legacy 600 N965LL (formerly N600LL) and this is its story. On 29 September 2006, a brand new $28 million Embraer Legacy 600 jet was on its maiden flight to the USA. Due to various errors by both the pilots and the air traffic controllers, the Legacy had a mid air incident with a commercial airliner (a Boeing 737). Amazingly, the Legacy jet sustained only minor wing tip damage and landed safely at an air force base in the Amazon. This is the story of getting N965LL to its home in the USA. After the incident, the aircraft was impounded and held at the Cachimbo Air Force Base, which is in the Southern Amazon, in the state known as Para, just south of the Equator. The authorities had a lot of investigation to be done and the aircraft sat in a hangar at the air force base while they sorted out what really happened and went through the legal procedures that are typical of an incident such as this. 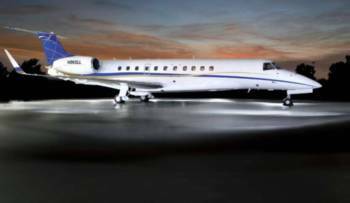 In mid 2009 our company, General Aviation Services, was contacted and asked if we wanted to buy the aircraft, as is, where is. The aircraft was still sitting in a hangar at Cachimbo Air Force Base. We reviewed the information on the aircraft provided in reports by various groups, including Embraer themselves, and said that providing we found the aircraft to be in satisfactory condition mechanically and that there were no other paperwork issues, that we would buy the aircraft. We decided to partner with Gantt Aviation, which is based in Georgetown Texas, and nine months later, in early March 2010, myself, Jay Gantt, and three engineers from Constant Aviation (which is the premier Embraer maintenance facility in the US) left the USA for Manaus, Brazil. When we arrived in Manaus, which is called the gateway to the Amazon, we still had to get to Cachimbo Air Force Base which is completely isolated in the Amazon. To digress for a moment, the Amazon (both in terms of the rainforest and the river) is something that defies comprehension. ‘Vast ‘ doesn’t do justice to the rainforests’ true size. The fact that the Amazon river discharges 20 percent of the world’s fresh water, carries more water than the world’s next six biggest rivers combined, and that 1 300km upstream in Manaus, the river is still several kilometres wide, it is difficult to imagine until you see these things in person. To this day, no bridge at any point has ever been built across the Amazon River. We had chartered an aircraft to take us from Manaus to the air force base. Driving was not a realistic option, since it was two days in a 4x4 from Manaus through the Amazon, in 35°C (95°F) heat with 90 percent humidity. If this was the Camel Trophy, we would have done it, but our purpose was to get to the aircraft, inspect it and get back home. The red-tape and clearances to land at the air force base had taken an inordinate amount of time to obtain and we had only a limited time to inspect the aircraft, so we were ready and motivated to get things moving forward. We had chartered a 1995 King Air B200 and arrived at the charter company to find we had been given a 1968 C99. No amount of complaining was going to change that, besides which we had other issues to deal with. The engine oil required for the Legacy, that we had ordered (and overpaid for), was nowhere to be found. Luckily we had a Brazilian Aviation guy with us and, miraculously, with a show of around $200, the oil was promptly located and given to us. The flight to the air force base was three hours. A testament to the remoteness of the place is that we did not see a road during the flight. Upon arrival at the air force base our Brazilian translator told us that we would be asked to have lunch at the base with the Colonel. I said that we were late as it is, and he replied that we would be having lunch with the Colonel. It was apparent to me that I had forgotten that the Chief of a land likes to know who his guests (or intruders) are, and that nothing happens on a Chief’s land without his consent. After a wholesome lunch, somewhere in the middle of the Amazon, we were taken to the aircraft which was stored in a massive canvas hangar that was actually built around the aircraft. It was something to see. Here was a brand new aircraft (total time 22 hours, eight landings), that had been sitting in the hangar for three years. The exterior was a little dusty, but with a swipe of my hand, the bright white paint shone through. The only evidence of any incident on the aircraft was the sheared-off left winglet. The interior, having been sealed for three years, was like the day it was delivered. I told the Constant engineers to get going on the aircraft and they diligently got working on checking the aircraft out. They boroscoped the engines, checked the avionics, drained and boroscoped the fuel tanks, checked the windows and windshields, and in short, checked every place on the aircraft that you could without pulling the aircraft apart. We had intended to run up the engines, but time was running out. The Constant engineers assured us the engines were in perfect condition and some Chief-of-theland constraints made it more difficult than it was worth. On top of that, we were introduced first hand to an Amazonian storm that left us struggling in the howling downpour, with many of the military base personnel helping to get the canvas hangar closed and buttoned up. By the time the hangar and the aircraft were back to the condition that we had found them, it was 22:30 and too late to leave and we were kindly given some barracks to stay in at the base. The Brazilian military were exceptional and very accommodating. Not only did they feed us and give us accommodation, but they were very helpful with the aircraft and hangar and did everything they could to make things happen. The next morning, after our thanks and goodbyes to the Chief, we departed in our C99 back to Manaus. One day later we were back in the USA. It didn’t take long to review our findings and make the decision to buy the aircraft. That was the easy part. It did take a long time to work through the paperwork issues, which included making sure of free and clear title and getting the export issued on the aircraft. Seven-and-a-half months after we got back from Cachimbo Air Force Base (and 18 months after we had started looking at the project), we were ready to go and get N965LL. We hired Constant Aviation to make the aircraft ready for flight. They put a team of 10 people together, and we flew them down in a Merlin IVC with all the equipment needed to get the aircraft ferryable to the USA. Flying to the airport base in a private aircraft was really the only way to do this project. They had spares, equipment, parts, tooling and so on that would have been a logistical nightmare for an airline to handle. The Constant Aviation team spent 21 days in Cachimbo Air Force Base. If you had any weight to lose, it was the perfect boot camp, with temperatures consistently at 35°C (95°F) and high humidity. Constant made some repairs to the left wing, fuelled the aircraft, started up the engines and did power performance runs, replaced all the wheels and tyres and did the work and inspections that were required by the US FAA DAR (Designated Airworthiness Representative) to give the aircraft a ferry permit from Brazil to the USA. Once the aircraft was ready to fly, it was flown to Manaus to clear customs and be exported, while the Merlin IVC made its way back to the USA. It took several days to clear customs and get the export issued and on 21 November 2010, five years after the incident and two years after we started work on the aircraft, N965LL landed safely at Cleveland International Airport in Ohio. It had been an exercise in patience and frustration, but it was an invaluable learning experience, and getting the aircraft back was a gratifying experience. Since the engines were sitting for three years, they were sent out to Rolls-Royce for inspection. The aircraft is going through a 48-month inspection and bringing all Airworthiness Directives and Service Bulletins up-to-date, and the left wing is being replaced with a serviceable wing. The new owner will receive an aircraft with 36 hours total time!